How did a bronze fitting from horse harness made in a workshop in Ireland more than 1200 years ago end up buried in a Norwegian Fjord? The answer lies in the series of Viking raids on the British Isles that began in AD 793. Researchers have described the likely scenario that took the piece of harness across the ocean. 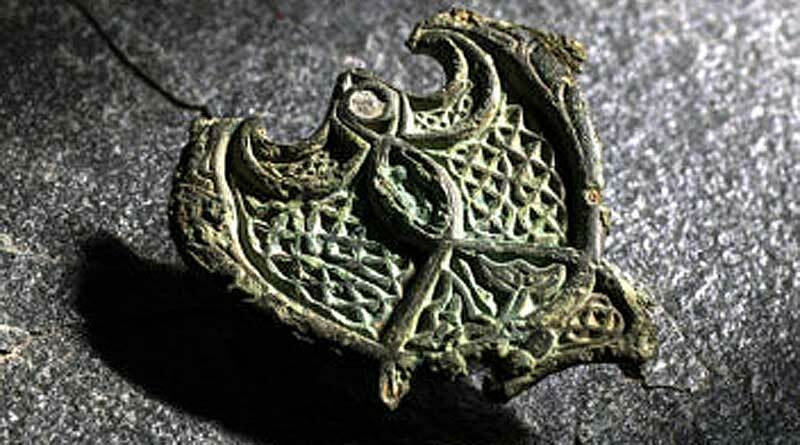 They surmise that a female Norwegian Viking who died some time during the 9th century was buried wearing what was considered a status symbol: a beautiful piece of bronze jewellery worn on her traditional Norse dress. In the summer of 2016, 1200 years after her death, the piece of jewellery was found by chance at Agdenes farm, at the outermost part of the Trondheim Fjord in mid-Norway. The well-preserved object is an ornament with a bird figure that has fish or dolphin-like patterns on both “wings”. Aina Margrethe Heen Pettersen is a doctoral student at the Norwegian University of Science and Technology’s Department of Historical Studies. She works with finds brought to Norway during the Viking age. She will now study the bronze brooch more closely, which has been curated and preserved by the university’s museum. She explains that fittings like this were popular among the Norwegian Vikings who took part in the first raids to the British Isles, at the very beginning of the Viking age. The fittings were originally attached to horse harnesses, like in this case, or to religious items such as books, crosiers or altar decorations. “A housewife in Mid-Norway probably received the fitting as a gift from a family member who took part in one or more Viking raids to Ireland or Great Britain,” she says. “As a result, it became clear to everyone that those women had family members who had taken part in successful expeditions far away. There are traces of gold on the surface of the jewellery, so it was originally covered in gold. It therefore appeared to be more valuable than it actually was. “In addition, each piece of jewellery was unique, so the owner did not risk having the housewife next door turn up with the same piece of jewellery,” Heen Pettersen says. Agdenes is strategically located at the south end of the mouth of the Trondheim Fjord, where it meets the Trondheimsleia Strait. The place is mentioned several times in the Norse sagas as a gathering place where ships with warriors met before their journey continued. Traces of King Øystein’s Harbour, which was established for military and defense reasons early in the 12th century, are found just next to Agdenes farm, where the bronze brooch was discovered. The harbour validates the strategic location of the place. It is possible that the area served as a natural gathering or stopping place for ships sailing from the Trondheim Fjord to the British Isles. Heen Pettersen says the bronze brooch was found by a private individual with a metal detector, so it is not a find from an archaeological site. The item of jewellery was not found in the original grave, which indicates that the grave at some point had been disturbed – perhaps during ploughing or other farming activities. The Viking women who owned this kind of jewellery were typically buried with grave gifts such as tortoise-shaped brooches, pearls, a knife and a spinning wheel, in addition to jewelry made from stolen fittings. “The new find from Agdenes farm shows that the area was populated in the first part of the Viking Age. Even though it is a random find, it is a nice reminder that Mid-Norway was involved in the early contact with the British Isles,” Heen Pettersen says. ← An equine Christmas miracle: But how did Banjo stay “invisible” for so long?